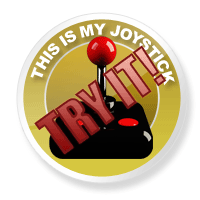 Review: Nier Review - This Is My Joystick! I must say, when I got Nier through the post, I hadn’t really heard a great deal about it. All I knew was that it had been developed by Cavia and published by Square Enix, which wasn’t a great deal of information. I had heard things from people saying it was a one button affair and that it didn’t look anything special, but it didn’t put me off, after all, I have to formulate my own opinion don’t I? After putting the game in the tray I was greeted by an audio only monologue from a woman that seemed to be talking to a character called Weiss. I say talking. I mean shouting abuse and profanity at him in a comical yet erm… enthusiastic way. This was before I had even started the game. Hell, I hadn’t even pressed start and new game, and I couldn’t help but wonder if the rest of the story was going to be as colourful. That said, I got the show on the road to find out if this game was worth shelling out for. The game is an action role playing game that puts you in the roll of a man called Nier who is searching for a cure to a curse that his daughter has. After his daughter falls in her ill state, she (his daughter) goes looking for a rare flower that can ease her suffering, only to be attacked by enemies called shades. 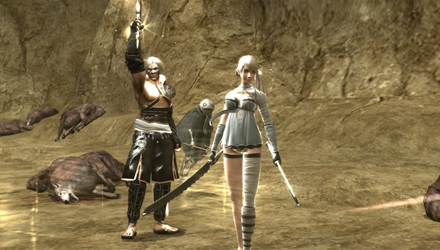 In the process of rescuing her Nier makes a pact with a floating, talking book called Grimoire Weiss. Utilising Weiss’s powers of magic, Nier sets off on a quest to not only find a cure but to help Weiss to defeat the other Grimoire (Noir) that has supposedly cursed her in the first place. While playing the game, you control Nier in the third person while exploring the world like you would in most adventure games. Combat is similar to what you would find in any western RPG but in a simplified adaptation, although it’s not quite a one button affair. You have a melee attack that you control with one button, and you have a variety of spells which can be assigned to any of the shoulder buttons, along with the block and evade. You also have a special attack but this varies on the type of weapon that you’re using (one handed sword, two handed sword and staffed weapons). Ranged attacks are done through magic which you unlock as you progress through the game. You can combine both magic attacks and weaponry, although combos only register when you do the physical attacks, which is pretty disappointing. Nier employs a simple levelling system that automatically makes you stronger the higher the level. After you gain enough experience you automatically level up increasing your strength, health and magic. Levelling up can be tiresome at times but luckily you don’t really need to do it to beat the more powerful enemies. Throughout the game you will come across various villagers in the different areas that require your help. Unfortunately you receive no experience from completing them, although you do receive various amounts of much needed money for completing them. Because you don’t gain money from defeated enemies, it is essential that you complete some for upgrades, potions and items that you’ll need throughout. Our heroes! Why is she wearing practically nothing? Both melee and magic attacks can be upgraded by using words. These words you can attach to your chosen weapon and your magic attacks with a maximum of two words. The words offer a variety of different abilities, such as greater magic or attack damage. Words are collected at random by defeating enemies; some are best suited to magic and some to weapons. Your weapons can also be upgraded by collecting various items and parts as you defeat enemies, but for the most part the ones you need are situated in the same area. After you have collected the items you can visit the one and only weapon smith in the game and he can upgrade your weapons. Finding the right parts can be a nightmare but you do see the benefits once you do upgrade them. You don’t need to search for the weapon smith due to being directed toward him during a story mission. For the most part of the game you have to travel around defeating enemies in pointless “fetch” style missions. 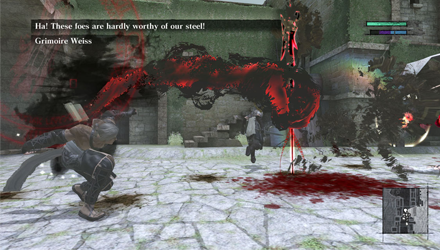 The gameplay does change slightly at given times by switching to a birdseye camera view and the combat changes slightly along with it. The style is similar to what you would find in games like Alien Breed, and although you can still use melee attacks the majority the emphasis is on magic. Another variation of the gameplay is at a certain part of the main storyline you are given what is basically a text based game, just like old adventure books. The aim is to listen to a story and then you are asked some questions based on the story you have just listened to. It’s not such a simple affair; the questions are always the same but the answers differ each time you get to one of these segments. When you mess up and answer incorrectly, however, you have to start the whole story again due to the answers changing. Paying attention is paramount, it may sound boring but it’s a breath of fresh air to have something different (even if a little annoying when you mess up the answers). There is also a simplistic fishing mechanic opened up later on, but only really used when accomplishing certain missions in one of the towns. Luckily these parts of the game are few and far between and don’t seem intrusive of the core gameplay. The different areas that you explore aren’t always bursting full of life. Most of the areas have enemies in them and the further through the game you get, the more enemies there are (and more often than not, more powerful ones). In the towns there also isn’t a lot of life and most seem desolate. You can buy several weapons and items in the shops in the towns and you can also pick up the mundane items like vegetables and other food products, which are not really needed for anything other than completing side quests. Even then, you can pretty much collect the items without spending any of your hard earned cash. Overall the towns seem like they are spread out too much, with loads of space with nothing really to do. There is the odd villager to talk to, sometimes with a side quest, but it seems pretty pointless using up so much space and not really having anything in it. The same could be said for the open field area between the towns, there are (to begin with) some enemies dotted about and some livestock that you can hunt. This means it can get a little boring traversing the world till later on in the game when you can skip the running about part by either riding a boar (which you get through a side quest) or utilising the boats (much later in the game). When you enter most buildings your view changes to a cutout, side-scrolling version without any real reason to do so. Enemies start off as pretty small and easy to defeat, the bosses, however, tend to be quite big and then get bigger. Some have specific weak points that you have to target and others you just hit the hell out of them till they die. Later in the game you find some of the standard enemies have a resistance to magic where as some can have a resistance to physical attacks. Further into the game some of the enemies get armour making them more difficult to kill, yet they are still equally as fast as they were without. Often you find yourself running for your life because you have been severely ganged up on. Getting knocked down is great if you get the chance to fight a bit more, but sometimes the enemy is relentless and before you know it, you’re dead. Now this isn’t an overly bad thing as it makes you have to think a bit more before jumping into a group of enemies. Luckily most of the time your AI partners come and help you out. As I just mentioned, you do get some AI partners, and for a change they aren’t as useless as you may think. The first one you come across is Kaine and as colourful with her language and as creative with her outfit (practically wearing nothing) as she is handy. Utilising both magic and melee attacks she tends to jump straight into battle when allowed to roam free. The second character you come across is a young boy called Emil, who for half the game is blindfolded as he can turn enemies to stone by looking at them. Later in the game Emil unlocks his true power and transforms into something more. Using mainly magic attacks he is more of a ranged partner. At stages of the game only one of the characters will accompany you, but later on both will come to your aid. Once you have a partner in crime you can open up your menu and direct what you want them to do. It’s nothing too special, though, and very basic to operate (pretty much all-out attack, defensive and stand there twiddling thumbs). Is that a floating book or have I gone mad? About now is generally the part when I tell you how great the graphics are,l but I would be lying if I did. The main character models are well designed but the insignificant characters (like the villagers) have no real detail. One of the Main characters is a woman (Kaine) who spends the whole game running around in her underwear, and although the outfit would look awesome on my missus, I really didn’t see the point. Most of the enemies tend to look the same and the only real difference would be size. There are some variations but mainly with the bosses. I supposed it doesn’t matter too much, but when you look at the likes of Final Fantasy then you see how little variety there actually is. The landscape, although initially doesn’t look too bad, is quite the opposite the more you explore. Grass looks like various shades of green paper against lino, and houses and buildings tend to look very blocky in some areas. Some rocky areas look very angular and the presentation seems hardly like a big deal in a current gen title. Now, I’m not saying it’s horrid game to look at or anything, but a bit more polish wouldn’t have gone a miss. Cut-scenes are all run by the in-game graphics engine and really aren’t anything special. As far as the voice acting goes the only two characters that really made an impact on me were Kaine and Weiss, who both seem to have real depth (foul mouthed Kaine being my favourite). The remainder of the voice acting is okay, but those two stand out far more. The strange thing about how the voice-overs are done is that little of the dialogue in the game is actually covered. What’s stranger is that you will be presented by written dialogue, and then half way through the voices cut in which is pretty pointless. Because a lot of the game isn’t voiced you are only left with the musical score to keep you company. As you explore the music takes over which is well composed with a mix of classic piano and vocals. This theme continues throughout the game and not only draws you into the story more but is relaxing and not over repetitive. It’s typical of Japanese composing and each area pretty much has its own theme. Some of the styles even reminded me of the music found in Final Fantasy VII: Advent Children. Now, I know that I have spent the entire review picking on the faults of Nier, but I did quite enjoy the game. I have to admit that it does warm on you after a while and even though it’s slow to start, the hours just start to drift by. Even though it’s not the same standard as most other JRPG’s, the game still holds its own. It may not be anything special but the story is compelling, and the gameplay is fun enough to keep you interested until the end. This game would be a must buy for RPG collectors like myself, but for the rest of the world I suggest you try before you buy.